A team of TRU law students placed second at the B.C. 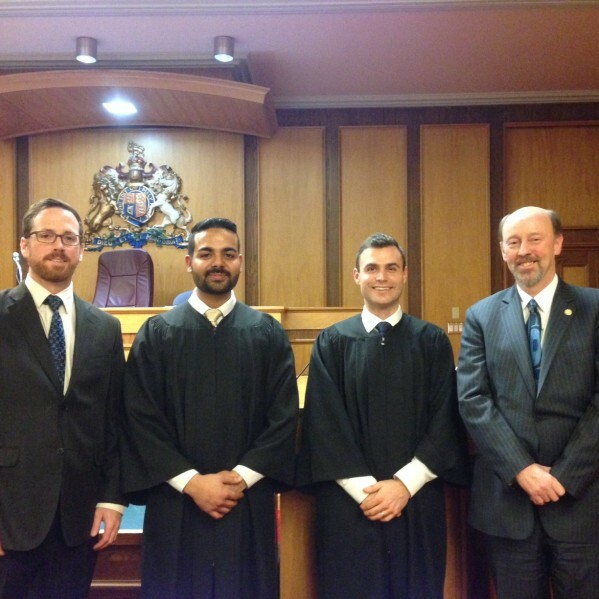 Law Schools Competitive Moot on Feb. 13 in Victoria. UBC took first and UVic placed third. The annual competition sees teams from each of the three B.C. law schools compete in a mock trial known as a competitive moot. “Two of the three judges made very explicit comments that members of our team were excellent, with a specific comment that one of our team members was better than many counsel who appear before her regularly,” said TRU Dean of Law Brad Morse. The TRU team consisted of law students Ravneet Arora, Taylor Topliss, Sean Manery, Erik Thorsteinsson and Nicole Chang, who acted as a researcher. The team was coached by Kamloops lawyer Shawn Driver and Vancouver-based lawyer Greg Pun, who is Queen’s Counsel. The hypothetical legal problem being argued at this year’s competition involved the complicity of a charity in the illegal release of bluefin tuna and was meant to simulate an appeals court, Driver said. TRU won last year’s competition which featured a privacy matter involving J.K. Rowling, and placed third in 2014. The hypothetical cases are derived from real cases that took place overseas but are then applied to the Canadian legal system, Driver said. TRU students argued both sides of the case against their counterparts from other universities. Arora and Topliss competed as respondents and Manery and Thorsteinsson acted as appellants. “The teams were selected the first week of October, then the problem comes out in the middle of October and then it becomes a mass panic research moment,” Driver said. “For those that want to go into litigation, this is the only opportunity, and the best opportunity to show them how to actually do the job day-to-day once they get into the real world. They learn tips as to factum writing and oral advocacy and get feedback from judges that they will never get in any class or even for the remainder of their career,” Driver said. There are several other opportunities for TRU law students to participate in legal competitions, including the Wilson Moot, which ran from Feb. 19 to 20 in Toronto. “I think there is a desire to give as many students an opportunity to moot as possible,“ Driver said.